The joy that comes from listening to music with friends is something that’s been around ever since…well, ever since music. But today, thanks to digital services that let you listen anytime, anywhere, music is now more often a solo experience. 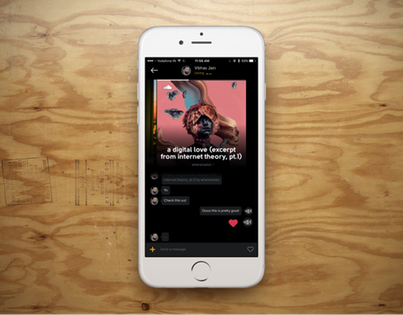 A new app called Lisn wants to change that, by offering you a way to listen to music with a friend, no matter how far apart you are, and chat about it right in the app. “It’s like sharing earphones,” the startup’s website proclaims – and indeed, it does seem like the modern-day version of handing one of your earbuds to a friend. The app allows you to stream and share tracks via SoundCloud and Spotify (either full tracks via Spotify Premium, or 30-second previews). These songs are then synced in real-time when your friend tunes in to listen along with you. The idea is that this offers a more interactive, engaging way to discover new music. Not only is there a personal recommendation involved, the co-listening experience is meant to be more fun than having a friend simply share a link to a song over a messaging app. That being said, Lisn supports the ability to forward songs through other apps, too. And it offers a way for you to listen to shared music even when your friend is not online. That is, you can tap the push notification or head into the app to listen to the recommended track whenever you choose. In this case, the sender will receive an alert that you’re streaming their shared track, and they can pop into the app and join you, if they’re available. When you find a song you like, you can save it to your Spotify or SoundCloud library for later streaming. In total, there are over 130 million tracks that can be shared then saved from Lisn. The idea for the app arose from a hackathon project back in October 2015, says Lisn co-founder and user interface designer Abhinav Chhikara. He and two other co-founders, Vibhas Jain and Abheyraj Singh, previously met while at Housing.com where they worked on the company’s mobile team. Jain was also the lead designer at PayTM, India’s most used digital wallet, before joining Lisn. And Singh, notably, worked on Airtel’s Wynk Music – one of India’s most popular streaming apps. A fourth co-founder, Bhargav Sosale, was a school friend whose background includes startup experience in Singapore. Following the hackathon, the founders begin to work on the app full-time. During its beta, Chhikara says they found Lisn was used more heavily by younger people. But it appealed to others as well, he claims. “To give you an example of how people have been using it, we’ve got couples in long distance relationships using the music-plus-chat experience to communicate. Friends from university who’ve now moved to different cities are using it to stay in touch and exchange tracks,” he explains. “Music producers using it to send music to their team and other collaborators, listening to it together and talking about certain parts of the song as it plays,” Chhikara adds. The app launched earlier this month, and recently hit #2 on Product Hunt. For now, Chhikara says Lisn is focused on growth, not monetization – that means the app is a free download, ad-free, and doesn’t require any subscription to use. The idea for social music listening, of course, has been tried before. For example, Turntable.fm was a hot site back in the day – so hot, in fact, Facebook even tried to copy it for a time. However, Turntable.fm failed to gain sustainable traction. However, Turntable.fm didn’t launch in the mobile-first era, and it was more about DJ-led sessions, not friend-to-friend recommendations as in Lisn. To give Lisn a try, you can download the app here.